Fee has provided her Comfort fabric conditioner and softener review. 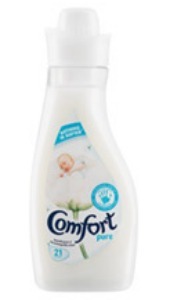 I use Comfort Fabric Conditioner which is the number one UK brand, and I was delighted to find it here in the Middle East when I moved here 10 years or so ago. We have 4 children, and living in a desert land our clothes are worn once and then washed. This could be taxing on the fabrics. I have an automatic washing machine, and I do 3 loads of approximately 7kg a load, each day. I can't even consider doing my laundry if I have no Comfort. I prefer the original brand, don't really go in for the exotic variants. Comfort protects the clothes, helps them line-dry faster and leaves fabrics smooth and soft. People have commentated on the light fragrance present on my family's clothes. It is lingering but subtle. I don't use dryer sheets as I line-dry and we have good weather, but when I lived in the UK, and the weather wasn't so good, I used my dryer. I was disappointed with the result of the dryer sheets, and felt the liquid softener was adequate. I've tried countless brands, and always returned to Comfort. My Mum uses the same brand. It is an excellent product, value-for money, and they even make a dermatology/allergy tested variant which I used when laundering baby clothes in the early months. I tried Downy/Lenor, and felt the softness and result was not as good as Comfort. I only wish it was available in a more concentrated form here in the Middle East. Here, the bottles are huge! Thanks Fee for your review. I always love your reviews and comments, because they are both informative and also fascinating to me, to compare what products you have available where you live in comparison to what I'm personally more familiar with where I live in the United States. Has anyone else used Comfort for softening their clothes in the wash? If so, you can share your Comfort fabric softener review here. In addition, you can share your fabric softener review here for any other brand, telling me what you like, or don't about it and why. Join in and write your own page! It's easy to do. How? Simply click here to return to Comfort fabric softener. Skin Rashes From Comfort Softener For "Sensitive Skin"
Yes it has an amazing long lasting smell but are the skin rashes which come along with it worth it???? I used the Comfort 'baby" for my entire family due to our different skin types I always choose a product for "sensitive skin types" but a few hours later after wearing the clothing item I would get a rash. Now at first I thought it was something I ate, but then realized the moment I stopped using Comfort on my clothes the rash would disappear. When I told a few of my friends about it it turned out that they have been getting the same reaction and even worse than mine and we were all using the same product in different scents but the exact same brand. 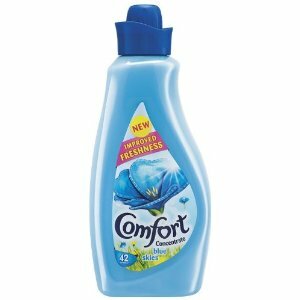 COMFORT FABRIC SOFTENER --- Never ever will I recommend it to anybody! Robyn, I'm so sorry you had this adverse reaction to a product that was supposed to be for those with sensitive skin. Unfortunately, it is not as uncommon as people think. I've had some allergic reactions to "hypoallergenic" products myself. I've created a list of hypoallergenic fabric softeners and other laundry supplies that you might want to check out, although with you being in South Africa the same products may not be available. Good luck with finding something that works for you with causing rashes, and I hope you and your family feel better soon! Has anyone else used this brand? If so, I'd love to hear your experiences with it. You can submit your own review here and I'll add it to the page. Comments for Skin Rashes From Comfort Softener For "Sensitive Skin"
Hi there I am so so impressed with the feel and small of the sensitive care comfort the one with the baby on the bottle, it is truly awesome. I give comfort 10 out of 10. I just simply love it. I recommend it to people wholeheartedly. The clothes are so so soft and fresh for days on end. wish they had these scents in other products too! I am from South Africa. I just wanted say that I LOVE Comfort fabric conditioner and wish Unilever could come with an air freshener and a spray to use on the clothes when it has been in the closet for too long. Also what happened to the gold bottle (Exotic)? I still love that one the best.